I’ve read, seen, and talked with people from all races that are enraged that President Obama released the long form of his birth certificate. Some people have passionately equated birthers, those that believe that President Obama was not a natural born citizen of the United states, to racists. The reason why some people in the left associate birthers as racists is they claim that no other president, which happen to be white, had to prove themselves as patriots and Americans. People are very sensitive about race and any criticism of the president is seen as presidential racism. All president’s have had to prove themselves. For example similar questions have been asked before with white presidents and candidates. For one, it is well known that John McCain was born in Panama, in US control territory. During the 2008 campaign, there was a lot of debate and discussion in the media about whether John McCain was American because he was born outside of the United States. In 2004, John Kerry was questioned about his patriotism and military service due to the swift boat incident and the purple heart he earned and later discarded. During his presidency, George W. Bush’s air nation guard record and college transcripts were made public to general criticism. And lets not forget that JFK’s American-ness and allegiance was questioned because he was an Irish Catholic. There is no question in my mind and in the media that President Obama will win his re-election in 2012. This is one of the reasons why to date no republican has declared themselves as a candidate. President Obama has already begun fund raising and if 2008 is any indication he will raise close to a billion dollars towards his campaign. President Obama will raise more money than any other candidate and it is his campaign to lose. From this perspective, there is no reason for him to disclose his long form birth certificate. Do not under estimate the President, this is a political and calculated move. You have to remember that the weeks leading up to the President releasing the long form birth certificate, the far left leaning media was talking about the President Obama’s birth certificate twice as much as any far right candidate. This is political theater at its best. As President Obama stated, this is a “sideshow and carnival of barkers” in which the President himself is the ringmaster. This debate is a political tactic to divide and conquer the will of the American people. While both sides of this political circus bark and bicker in unison about non-issues, Americans are dealing with difficult situations every day, such as a weak dollar, prolong recession, three wars, falling home prices, high unemployment, failing infrastructure, rising health care costs, illegal torture, poor performing school, $5 gas prices at the pump, and institutionalized corruption from Wall Street to the Federal Reserve. It is the nature of democracy to question your public officials. Each president will have his own set of circumstances that dictate the questioning. But don’t underestimate the media’s involvement in planting the seed in peoples minds in the form of surveys and polls and interviews of random people in the street. There are a lot of issues that don’t get any air time and everything you see in your nightly network news is crafted and edited to implant an idea in your mind. Each president and candidate has had to answer his critics, it’s the nature of the job. I for one will encourage the President release more information, that he be as transparent as possible. For example, I’ve enjoyed looking at the official released IRS documents for the last two presidents and vice presidents. I found it interesting how Joe Biden makes no income outside of his Vice President salary. It is not racism to demand more transparency from our government, its elected officials, and all of its agencies. I wish we all demanded more of our government and that we all read the laws and bills that they enact. In the span of about 10 years, the price of gas has increased by over %400. The lowest price of a gallon of gas I remember paying was about $1.15. If this trend is to continue, by 2020 one gallon of gas at the pump will cost between $16-$20. I filled up my car earlier in the week and paid about $4.20/gallon which totaled over $60 to fill my tank up. I project we will be paying at or about $5 by the end of the year. Even at $5 there will be little protests at these prices, simply because everybody is already trying to juggle mortgage, credit, poor job options, poor pay, higher taxes, tolls, and fees from just about ever local, state, and federal agency. Simple put, people are in economic limbo. Gas prices are inverse limbo line, how high will they go? I don’t speak Arabic or have have any training in the language beyond what is in popular culture and media. One thing I know is that Arabic is spoken across most of North Africa, Saudi Arabia, Iraq, Jordan and Syria amongst others countries in the Middle East. But Arabic has influenced and infused with other languages such as Farsi and Urdu. Another reality is that Western languages have difficulties and inconsistencies westernizing Arabic words. For example, if you have been keeping up with the civil war in Libya you would have noticed that there are about five or six different spellings for Muammar Gaddafi. In some articles he is Gaddafi, Ghaddafi, Qaddaffi, Kadafi, Laffy Kadaffy, etc. The Christian Science Monitor delved into the correct spelling of the name of the Libyan leader. Another similar example is the name Muhammad. By some estimates, the name Muhammad is the fasting growing boys name in popularity. I know of at least four or five different spellings of Muhammad, such as Muhamed, Mahomet, and Mohamed. When growing up President Barack Obama actually adopted a western name to be identified. For years he was known as Barry instead of Barack. If you research the name Barack, the name is a variation of the Arabic word Baraka, which can be translated to “blessed one.” In fact, Mubarak is another form of Barack or Baraka. President Obama full name is Barack Hussein Obama II, well at least that is what Americans believe is his full legal name. His actual birth name is unknown because he and his administration have keep his birth certificate under lock and key which most Americans can conclude he is hiding aspects of his true identity. There is no denying that his name is Arabic and that his father was a Kenyan Muslim. Now a letter written by Gadaffi to President Obama has surfaced where Gaddaffi addresses the president as “Our dear son, Excellency, Baraka Hussein Abu oumama.” Could this be President Obama’s true name? President Baraka Hussein Abu oumama II. Is Baraka Hussein Abu oumama the name on President Obama’s real birth certificate? I’ve lost all faith in the media. On one side they don’t actually do much journalism anymore, they are cowed into not reporting information that has not been deemed ‘declassified’ so they are left reporting press releases and Facebook status updates and they are always ready to take credit when they ‘investigate’ a lead on Twitter. Andy Carvin, the senior strategist at NPR, recently ‘debunked sloppy reporting’ about possible Israeli-made weapons in the civil war in Libya. Oh, by the way, it’s a full scale civil war. It’s not a protest, uprising, opposition, rebellion, it’s a full scale civil war that is functioning as a proxy war between regional super powers but you won’t hear about that in the news either. 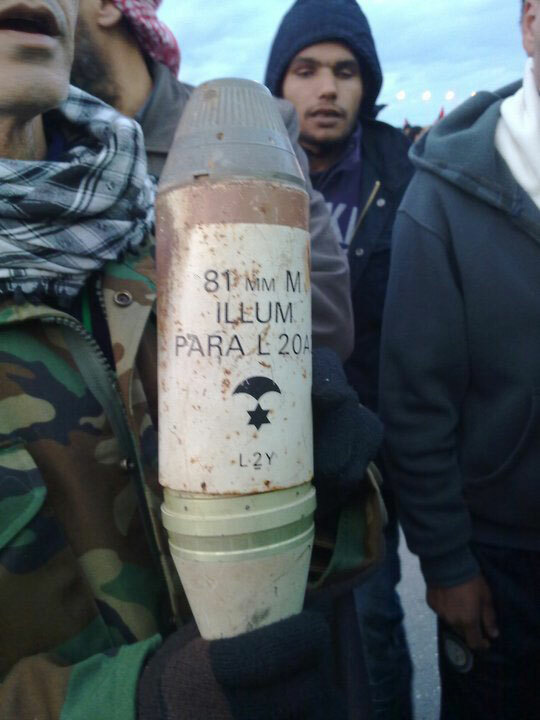 An image surfaced in Facebook of a mortar shell used by Ghaddafi forces on the rebels with a insignia that to me immediately looked as a ‘star of david dangling from a parachute.’ I don’t read Arabic, but it seems that those that posted the image are claiming this to be irrefutable proof that the Libyan government are using Israeli munitions on its people. Andy Carvin took it amongst himself to prove this wrong using his journalism degree by just reposting the link on his Twitter account. LOL. This is is journalism in the age of social media, putting up your twitter account and reposting links. You can read the timeline of how Andy Carvin unearthed the fact that the shell is “most likely British made” and the graphic is probably an iconography describing the purpose of the shell. The icon of what seems like the star of David depicts indicates that it’s a flare. If you look closely at the image in question, you can deduce the function of the shell from the label and icons on the shell. It reads “81 mm M ILLUM PARA L 20A L2Y.” The shell even includes the lot number. Anyone with common sense can know that this image doesn’t necessary mean that Israeli is backing or has backed the Libyan government. Even thought this seems like common sense, it’s apparently not common sense for journalists like Andy Carvin who is taking credit of his ‘findings’ and social media mad hatter skills of Twitter, Google, and Facebook to ‘debunked sloppy reporting’. What is sad, is that he doesn’t dig deeper than these shallow findings. For one, from the ‘intelligence chatter’ that I am picking up, a great many of the rebel fighters think they are rebelling against their government because they have been told that it’s backed by Israel. The propaganda of this image in pro-Arab Facebook groups and Andy Carvin’s investigated journalism seems to confirm this. Someone is telling the rebel fighters that Israel is involved. The question is who is feeding this anti-Israel and anti-Ghaddafi propaganda to the rebels? Andy Carvin should also following up on why we are actively involved in Libya’s civil war but do very little to prevent the massacres taking place in the Ivory Coast.